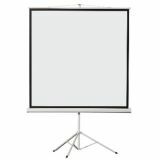 Buhl Series Wall Screens, 50" x 50"
The Buhl projection screen is constructed with a durable octagonal Aluminum casing and spring roller mechanism, for a reliably smooth rolling and retracting of the projection screen fabric. In additional to the typicial handle, a pull cord is included to make reaching for higher installations a little easier. Wall mounting brackets are available to purchase separately, if additional space is required from the wall or ceiling surface. 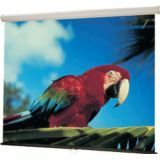 Simple and reliable, this screen offers a rugged and efficient projection solution for daily use, at a very affordable price. The most versatile screen fabric surface and the premier choice when ambient light is controllable. The HamiltonBuhl Matte White projector screen fabric evenly distributes light over a wide 120° viewing area, while colors remain bright and life-like, with no shifts in hue or contrast. 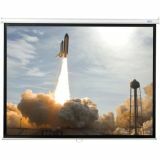 With a Gain of 1.0, this projector screen fabric allows for no loss of brightness from the projection source, as long as ambient light is controlled. 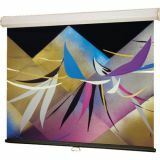 A black backing to the fabric is also added to impede any light penetration from behind the projected surface. The matte white screen surface can be easily and safely cleaned with mild soap and water. Do not use any other stronger chemical cleaners, as this may negatively affect the projection surface. The fabric surface is also flame retardant and mildew resistant. Buhl Series Wall Screens, 60" x 60"
Buhl Series Wall Screens, 70" x 70"
Buhl Tripod Screens, 50" x 50"
Buhl Tripod Screens, 60" x 60"
Buhl Tripod Screens, 70" x 70"